李津津, 张合, 吕国军, 等. 廊坊市活断层探测数据管理系统[J]. 地震地磁观测与研究, 2017, 38(4): 212-217. DOI: 10.3969/j.issn.1003-3246.2017.04.036. 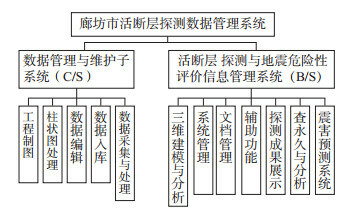 Li Jinjin, Zhang He, Lv Guojun, et al. 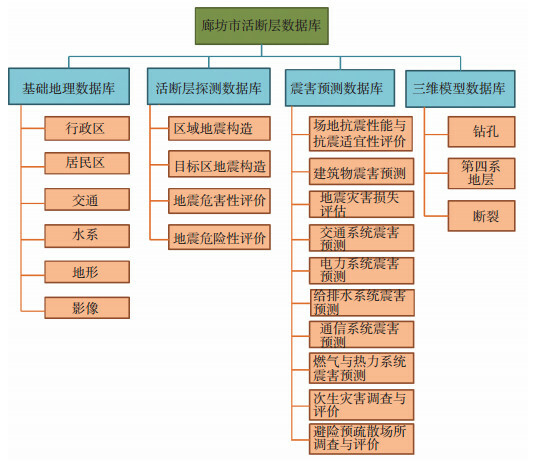 The active fault detection data management system of Langfang City[J]. Seismological and Geomagnetic Observation and Research, 2017, 38(4): 212-217. DOI: 10.3969/j.issn.1003-3246.2017.04.036. 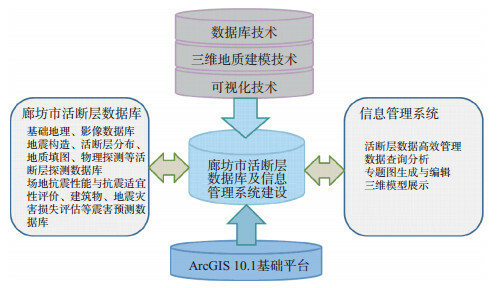 Abstract: The active fault exploration data management system of Langfang City is developed according to the actual demand of government and the public, based on the former basic geographic data and work of active fault detection in Langfang City. Using GIS technology, 3D visualization technology and network technology, the system has the powerful functions of construction, storage, analysis, management and application of 3D display to archive scientific management of active fault information and to provide the information service for urban and rural planning, earthquake emergency, land use, and the site selection of the major projects. 陈运泰, 杨智娴, 张勇, 等. 从汶川地震到芦山地震[J]. 中国科学:地球科学, 2013, 43(6): 1064-1072. 方盛明, 张先康, 刘保金, 等. 探测大城市活断层的地球物理方法[J]. 地震地质, 2002, 24(4): 606-613. 江娃利. 有关1976年唐山地震发震断层的讨论[J]. 地震地质, 2006, 28(2): 312-318. 李西, 张建国, 谢英情, 等. 昆明城市活断层信息管理系统及数据库建设综述[J]. 地震研究, 2008, 31(Z2): 612-618. 李珀任, 吴建平, 黄静, 等. 基于实时技术和3D WebGIS的地震信息发布系统[J]. 地震地磁观测与研究, 2016, 37(1): 107-112. 马东辉, 李刚, 钱稼茹. 强震地面断裂时土地利用适宜性的概率评估[J]. 清华大学学报(自然科学版), 2006, 46(3): 309-312. 邱胜海, 王云霞, 樊树海, 等. 云环境下图数据库建模技术及其应用研究[J]. 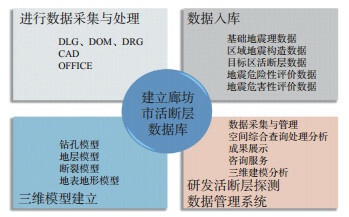 计算机应用研究, 2016, 33(3): 794-797. 王伟, 王行舟, 张洁, 等. 基于数据库和GIS技术的地震会商系统[J]. 地震地磁观测与研究, 2015, 36(1): 127-130. 徐锡伟, 于贵华, 马文涛, 等. 活断层地震地表破裂"避让带"宽度确定的依据与方法[J]. 地震地质, 2002, 24(4): 470-483. 于贵华, 徐锡伟, 孙怡, 等. 城市活断层探测信息系统的设计与实现——以福州市活断层信息管理系统为例[J]. 地震地质, 2006, 28(4): 655-662. 于贵华, 徐锡伟, 柴炽章, 等. 利用活断层探测资料构建银川探测区地下三维结构模型[J]. 地震地质, 2007, 29(2): 320-329. 余中元, 杨金山, 刘双, 等. 地球物理方法在城市活断层探测中的应用研究——以哈尔滨城市活断层探测项目为例[J]. 工程地球物理学报, 2008, 5(4): 428-434. 张勇, 许力生, 陈运泰. 2010年4月14日青海玉树地震破裂过程快速反演[J]. 地震学报, 2010, 32(3): 361-365. 中国地震局. JSGC-04中国地震活动断层探测技术系统技术规程[S]. 北京: 地震出版社, 2005. 中国地震局. DB/T 15-2009活动断层探测[S]. 北京: 中国标准出版社, 2009. 中华人民共和国住房和城乡建设部, 中华人民共和国国家质量监督检验检疫总局. 建筑抗震设计规范(GB 50011-2010)[S]. 北京: 中国建筑工业出版社, 2010. 朱金芳, 黄宗林, 徐锡伟, 等. 福州市活断层探测与地震危险性评价[J]. 中国地震, 2005, 21(1): 1-16.